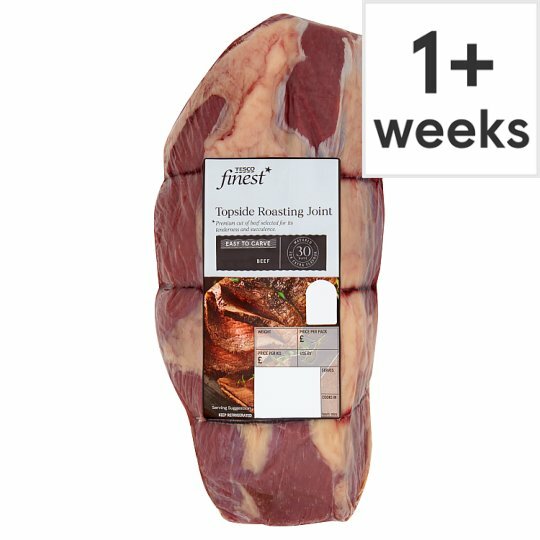 Aberdeen Angus beef topside roasting joint. Instructions: Oven 180°C/Fan 160°C/Gas 4 Rub or brush the joint with a little oil and season with sea salt and freshly ground black pepper, cover the joint tightly with tin foil. Place joint in a roasting tray and cook in the centre of a pre-heated oven. Calculate cooking times at 6 minutes per 100g (medium), 8 minutes per 100g (well done). Remove tin foil within last 15 minutes of cooking time. Allow joint to rest for 10 minutes before carving. Remove string prior to serving. Medium meat will be pink in the middle. Well done meat will be brown right through. Tip: Use meat juices collected in roasting tin to make a rich beefy gravy. Allow meat to relax at room temperature for 30 minutes before roasting.